Donna Tipton is the parent volunteer that every PTA president dreams about. She is always ready, willing and able to give her time and talent in many capacities at Kendall Elementary School, where her children Brett and Ella attend. For her dedication in supporting students and teachers, she is being recognized as the District 204 BMO Harris Bank Volunteer of the Month. She first started volunteering for room parties and helping in the classroom. She then began volunteering monthly at the Library Media Center where she currently designs and installs the popular display wall murals. She coordinates volunteers for the LMC and is an executive board member on the Kendall PTA. Her behind-the-scenes work has led to publishing the school directory; scheduling restaurant nights; and bringing in a new line of spirit wear for students and staff. Over the past year, she helped launch several new initiatives including Donuts for Dads, Muffins with Mom, classroom raffle baskets and the first Kendall Fun Run. Her inspiration as a volunteer was her high school youth group adviser in her hometown of New Milford, Conn. After she married her husband, Dave, in 2000, they volunteered as youth group leaders in New York for several years. Her real dedication to volunteering began after her 3-year-old niece, Hanna, lost her battle with cancer in 2006. She found courage and strength from her brother and sister-in-law, who founded the Butterfly Walk for CancerFree KIDS in 2007. Tipton has volunteered with them on the walk over the past seven years and has helped raise over $490,000 for pediatric cancer research. BMO Harris Bank is helping District 204 recognize one volunteer each month who has generously given his or her time to support District 204’s students and schools. To celebrate these outstanding volunteers, BMO Harris Bank is donating $1,000 to the volunteer's school. To nominate an outstanding volunteer, visit Volunteer of the Month. 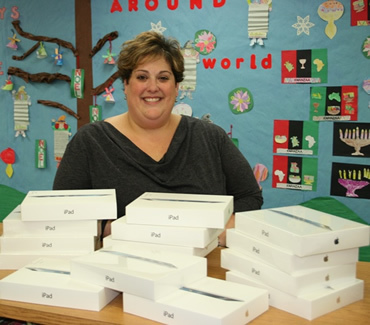 District 204 BMO Harris Bank Volunteer of the Month Donna Tipton with 15 iPads that were purchased from funds raised by the Kendall Fun Run, which she organized. 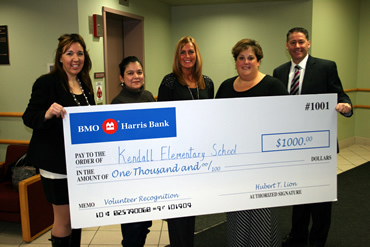 BMO Harris Bank presents $1,000 check to Kendall Elementary in honor of Donna Tipton who is the District 204 BMO Harris Bank Volunteer of the Month for January. (L to R) Nicki McIntyre – Branch Manager BMO Harris, Vicki Chow – Kendall PTA President, Lena Guerrieri – Kendall Elementary Principal, Donna Tipton, and Chris Michalski – Market President for BMO Harris Bank-Naperville.